A new paper published in Geophysical Research Letters finds that the radiative imbalance from greenhouse gases at the top of the atmosphere has increased over the past 27 years while the rate of global warming has unexpectedly decreased or 'paused' over the past 15+ years. This finding contradicts expectations from AGW theory of increased 'heat trapping' from increased greenhouse gases. However, the finding is consistent with radiosonde observations showing that outgoing longwave radiation to space from greenhouse gases has unexpectedly increased rather than decreased over the past 62 years, inconsistent with more heat being "trapped" in the mid-upper troposphere. According to the authors, the radiative imbalance from 1985-1999 was less than from 2000-2012 during the 'pause' in global surface temperatures. "Over the 1985-1999 period mean N [radiative imbalance] (0.34 ± 0.67 WM–2) is lower than for the 2000-2012 period (0.62 ± 0.43 WM–2, uncertainties at 90% confidence level) despite the slower rate of surface temperature rise since 2000." "While the precise magnitude of [radiative imbalance] remains uncertain, the reconstruction captures interannual variability which is dominated by the eruption of Mt. Pinatubo in 1991 and the El Niño Southern Oscillation." However, Willis Eschenbach has shown radiative imbalances at the top of the atmosphere from the Pinatubo eruption have had essentially no effect on surface temperatures, which is observational evidence that emergent thermodynamic phenomena control temperature and the climate, rather than radiative imbalance from greenhouse gases at the top of the atmosphere. Combining satellite data, atmospheric reanalyses and climate model simulations, variability in the net downward radiative flux imbalance at the top of Earth's atmosphere (N) is reconstructed and linked to recent climate change. Over the 1985-1999 period mean N (0.34 ± 0.67 WM–2) is lower than for the 2000-2012 period (0.62 ± 0.43 WM–2, uncertainties at 90% confidence level) despite the slower rate of surface temperature rise since 2000. While the precise magnitude of N remains uncertain, the reconstruction captures interannual variability which is dominated by the eruption of Mt. Pinatubo in 1991 and the El Niño Southern Oscillation. Monthly deseasonalized interannual variability in N generated by an ensemble of 9 climate model simulations using prescribed sea surface temperature and radiative forcings and from the satellite-based reconstruction is significantly correlated (r ∼ 0.6) over the 1985-2012 period. The skeptic science is solid but the laughable stuff crammed into models by paid warmists has resulted in failure. The IPCC is untangling itself with "low confidence" in evidence of CO2 warming. Governments better start listening to the latest science because there comes a point of no return and with over 15 years with no increase in Global Warming that point is approaching fast. First off, let’s start with the alleged “radiative imbalance”, all of the radiation starts at the surface of the Sun (well except for a wee little bit of starlight, but that pales in comparison). Then it travels (at the speed of light) to the surface of the Earth where it gets absorbed and remitted as IR radiation. A small portion of this IR radiation is then “diverted backwards” towards the surface due to the actions of “greenhouse” gases. This radiation is simply making a “return pass” through the Earth’s atmosphere (at the speed of light). It is NOT additional radiation, there is NO RADIATIVE IMBALANCE. A “radiative imbalance” would be caused by multiple sources of radiation, like two light bulbs illuminating a tanning bed. But there is only one SOURCE of radiation, the Sun, and therefore there cannot be an imbalance with only one source. The “greenhouse effect” simply delays the flow of radiation from the Sun to the Earth and then onwards to the energy free void of space by causing said radiation to make multiple trips. These trips happen at the speed of light, generally considered to be “quite quick”. The “greenhouse effect” simply acts as a sort of hybrid “optical/thermal” delay line. Optical delay lines are well understood, but a bit uncommon. A simple optical integrating sphere (hollow reflective sphere containing a light source) exhibits this delay line effect, research the “temporal response of an optical integrating sphere” for more info. The measurements imply that “more” radiation is being “delayed” by this effect since they are looking at the specific wavelengths where this effect occurs. But the instruments cannot directly see the delay when the input is “steady state” (i.e. constant sunlight). Since this delay is fairly slight (distance to TOA times speed of light times several “bounces” = tens of milliseconds) the overall effect of the “greenhouse” gases is to delay the energy a little bit. This causes the gases (all gases, GHG and non-GHG) to warm up slightly faster after sunrise and to cool off slightly slower after sunset. This effect is so minor that we probably cannot afford to measure it. AND this effect makes no difference with respect to the average temperature of the Earth. The “greenhouse” effect is an optical illusion, a mirage, a chimera, without careful consideration of the speeds (velocities) at which the radiation travels through the system it is tempting to convince yourself that heat is actually being “trapped”, but that is not the case at all. In contrast a thermal insulator actually slows the velocity of energy, which can be quite useful if you want to spend less money on energy (natural gas, oil, coal, electricity, etc) to “fill up” your living space with thermal energy. The slower it escapes to colder locations the less often you have to “re-fill” it (handled automatically by your friendly thermostat connected to your furnace). This is NOT "unexpected", to anyone who has taken my 2010 Venus/Earth temperatures comparison seriously, as the definitive evidence of no greenhouse effect, no "heat trapping"; and no one apparently HAS taken that utterly clear evidence seriously--for over 3 and 1/2 years now--among the loudest and most-followed voices on both sides of the intellectually-challenged "debate". The radiation transfer theory, as applied in climate science, is, or should be, obvious nonsense, to any classically trained physicist, who KNOWS (for example) that the Earth's surface cannot put out as much radiative energy as a blackbody, in a vacuum, at the same temperature (which, by the way, also massively violates the conservation of energy). Both sides are allowing utter garbage to be promulgated seriously, and have brought science into the gutter. Have any of you never understood the biblical saying, "If thine eye offend thee, pluck it out"? That means, in science, if your theory--even your best, most admired theory--is contrary to even one plain fact, you have to throw it out. 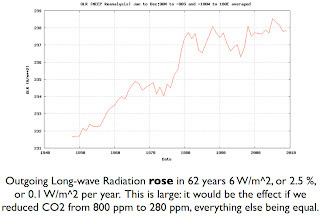 Radiation transfer theory is worthless in predicting changes in atmospheric temperatures (as anyone with a lick of sense should know, when they say 0.04% carbon dioxide is responsible for such changes, despite the clear stability of the hydrostatic vertical temperature lapse rate in governing the atmospheric temperature, as demonstrated in both the century-old Standard Atmosphere model, and the precise confirmation of that model in my Venus/Earth comparison). No one is alive today that would have experienced the Mini-ice age from about 1650 AD to 1850AD but there are plenty of historical records to refer to, things like the freezing of the Themes, failed crops, short summers, long winters, gee that sounds like last winter in England and Europe. Real documented weather data shows that there has not been any increase of average earth atmospheric temperatures for 17years & 10 months and still counting. A lot of people have the heads up there a**es because they don't want to believe real experimental data that proves that the GHGE does not exist. Man-made climate change is a political hoax. History will show that the "Skeptics/Deniers of man-made global warming are "right" and the rest of the world have been tricked by political hacks and media nitwits that never took a single class in science. Real scientists that study weather and climate know that the two primary controlling factors are solar energy and the water cycle. The water cycle keeps the earth from getting to hot. With the amount of water on earth it would take a billion years for the oceans to dry up. I’m not waiting for that to happen. I cannot hold my breath that long. Wouldn't this article have been coded as falling with the 99% of "consensus"? Wouldn't this study fall under the 99% "consensus on AGW, even though it clearly contradicts at least some major portions of AGW theory? Yes, no doubt Cook et al would claim it supports their imaginary consensus. IF there had been a 'tropical hot spot' forming over the past 30 years of so, this outward radiation would be falling rather than rising, correct? Latitude–At your suggestion, I read the Allan et al paper linked by Hockeyschtick. The description of the various datasets employed to try to extend the CERES measurements back to 1985 is an amazing saga of errors, assumptions, etc. that lead me to believe we do not have a handle on the radiation imbalance. As far as I can tell, their estimates have such wide error bands they are nonsignificantly different from zero. Note their 90% CIs in the abstract. The tops of clouds dump the heat via condensation of rain / snow / hail as IR that goes into the stratosphere. In the stratosphere, CO2 radiates that heat to space. More CO2 mean more radiated heat from the stratosphere. More surface heat means more water radiating heat. In all cases, it is more heat transport up up and away… There is no ‘trapped’ heat. CO2 is too leaky to trap anything.